God is good! It is exciting to see what the Lord is doing throughout the world. It can be very tempting to get discouraged if we look around the world and see what is transpiring. Jesus said that right before His return, the world would be under the same influence that it was under during the times of Noah and the times of Lot. (Luke 17:26-30) We are seeing that come to pass more and more each day. Jesus also said in reference to the time before His return, that things were going to get worse and worse and that even believers would be persecuted and some would be put to death. But then He said something amazing. Jesus said, “Now when these things begin to happen, LOOK UP AND LIFT UP YOUR HEADS, because your redemption draws near.” (Luke 21:28) The tempting thing would be to look around, but Jesus said to LOOK UP. When we look around, we become distracted with things that weigh us down and we begin to fret because of the problem or the evildoer who seems to prosper in his way. (Psalm 37:7-8) But when we look up, we will maintain our faith, peace and joy. Most people do not know that there is a grace available that will enable them to endure in the evil day. There is a grace available to the believer to stand and to not become discouraged. The temptation can be to try and hide ourselves away or to go into self-preservation mode. Just as people need to hear that God has made His grace available for healing and salvation before they can believe and thus receive the grace that is available to them, people need to know that there is a grace available to stand so that they can believe and receive the ability to stand in the evil day. In the three-part teaching series Standing in the Evil Day, you will be encouraged to look up, to feed on His faithfulness and learn that there is a grace that is available to tap into, even in the face of persecution or any hardship that you may be going through. We recommend that you go to our website and listen to that series. In keeping with the focus of this letter, we would like to encourage you with what God is doing through Kingdom Equippers Ministries. We trust that this will help you to LOOK UP instead of looking around at what you may be going through. At the beginning of April, we had the privilege of ministering at the CBC Bible school in Plymouth, Massachusetts, during their campus days. After ministering, people said that they were blessed by the Word we shared. During one of Lisa's sessions, she taught on how Jesus is the same yesterday, today, and forever. She taught that if He could meet your needs yesterday, He'll meet your needs today. She shared the testimony from many years ago when she was in Bible school. A dread had come over her as she was getting into the shower one day, as she thought about the fact that it was time to pay rent on the apartment. She heard the Lord chuckle as He said to her, “Do you think I would take care of last month's rent and not provide this month's rent?” A young lady was visiting during that session and she was experiencing a financial drought during that time. She said that this testimony really blessed and encouraged her to trust in His goodness. If you’ve ever seen God come through for you, He hasn’t changed! But are you looking up, or looking around? 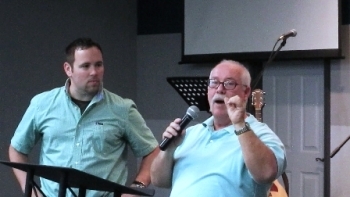 Next stop, we went to Perryville, Missouri, at the beginning of May, where we taught at Perryville Family Church. We had a great time of ministry and saw many healings take place. 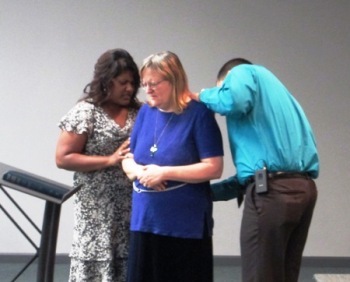 An elderly lady named Sandra was healed of stenosis of the spine after having it for twenty-five years. The doctors even said that she would end up paralyzed. She needed many pillows on her bed to try to sleep comfortably at night and hadn't had a good night's sleep in a long time. After we prayed for her she was healed and had no more pain. She went home that night and slept comfortably with just one pillow and was finally able to have a good night's sleep. 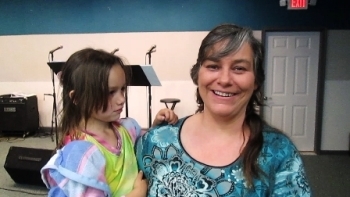 Her daughter Sherry, now 41 years old, had messed up her back and spine in a car accident when she was sixteen. The Lord also healed her back and spine and she stopped having the pain in her back, legs and arms that she had since the accident. We also prayed for the bass guitarist of the church, whose name is Larry. He had carpal tunnel syndrome in his wrist and it would get numb and make a popping sound in his finger. After we prayed for him, the popping sound left and he went home that day and was able to play for three hours straight without any pain or numbness in his hand. Another lady had fallen and damaged her tailbone earlier in the week. She couldn’t even sit without excruciating pain. As Sean preached, she was in obvious serious pain and discomfort. After the message, she came up for prayer. 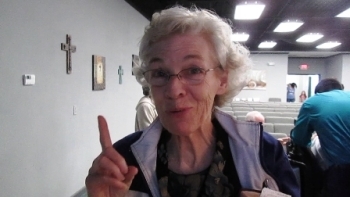 As the whole church watched, God healed the lady and totally restored her tailbone. She went and sat down as we continued to pray for people. A few minutes later, she testified to the church that she was able to sit without any numbness or pain and that she was totally healed. We don’t know what you are going through or what you may face in the future, but LOOK UP and not around. Jesus loves you and He has a grace available that is only available in difficult times.